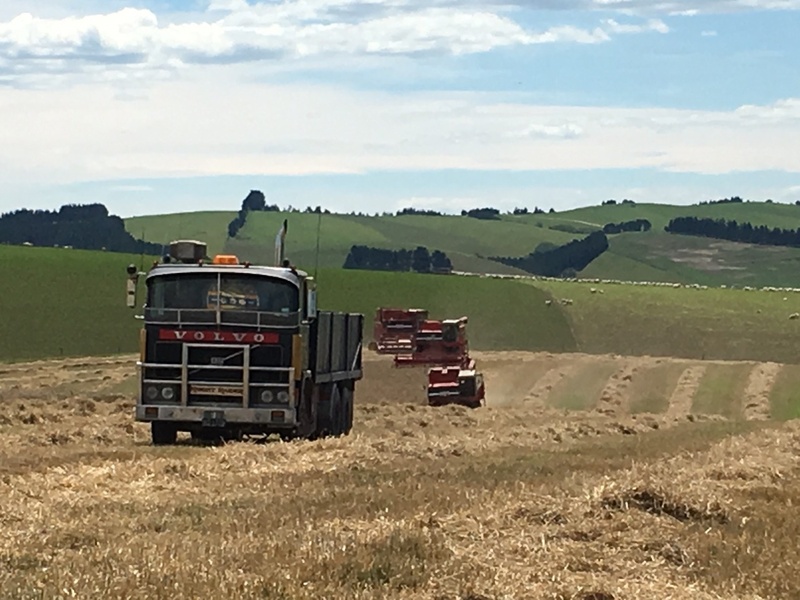 Once again I have received some more photos of global custom cutter Cameron Mckays harvest in New Zealand, using their beloved Masseys. 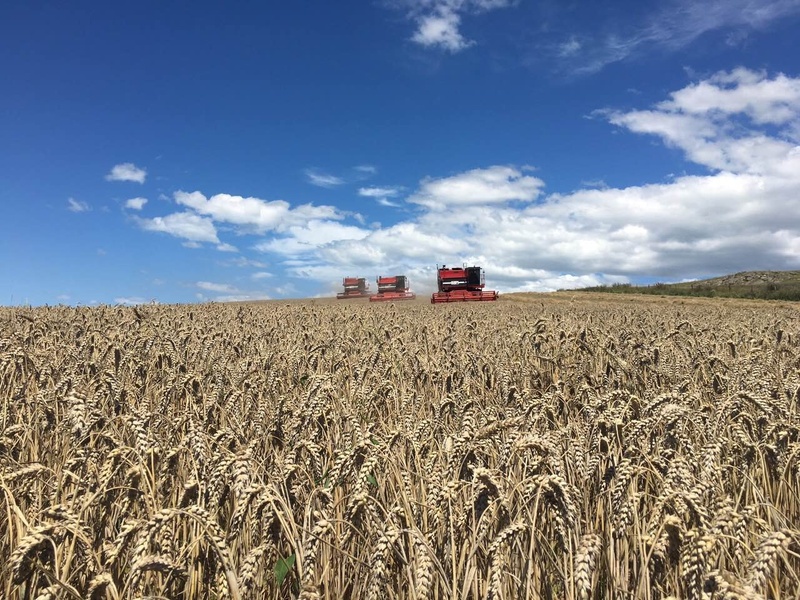 The harvest got off to an unseasonably wet start in December and the team lost a couple of weeks cutting, but every cloud has a silver lining and this loss of time enabled them to carry out repairs and vital work for their new addition to their small fleet. 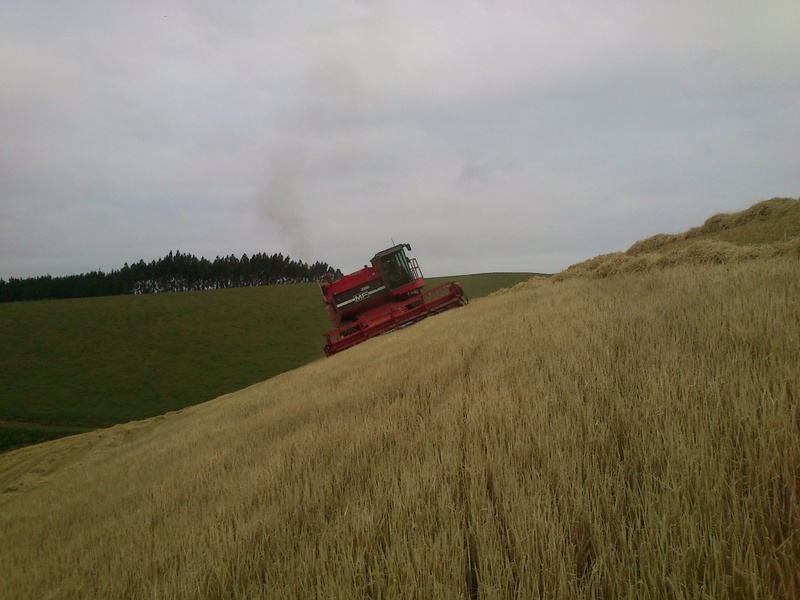 It was thought this new combine wouldn't be ready for this harvest as they had just bought it and hadn't time to carry out repairs!. The combine in question is another 760 1977 model in mint condition, that needed the customary work over as it hadn't cut for two or 3 years. 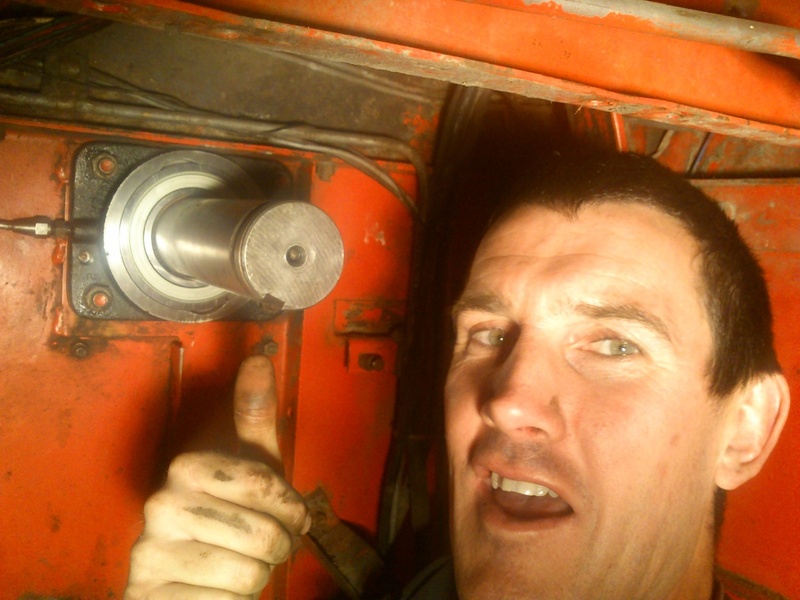 Cameron himself has done some vital repairs on his own combine this season, he has replaced the sieves with a mint second-hand set sent from England, also he has replaced the rear beater bearing for the forthcoming harvest. Cameron and his business partner and fellow combine owner Andy McEwan bought the new combine from a fellow Massey owner who had ran the 760 for over 30 years. 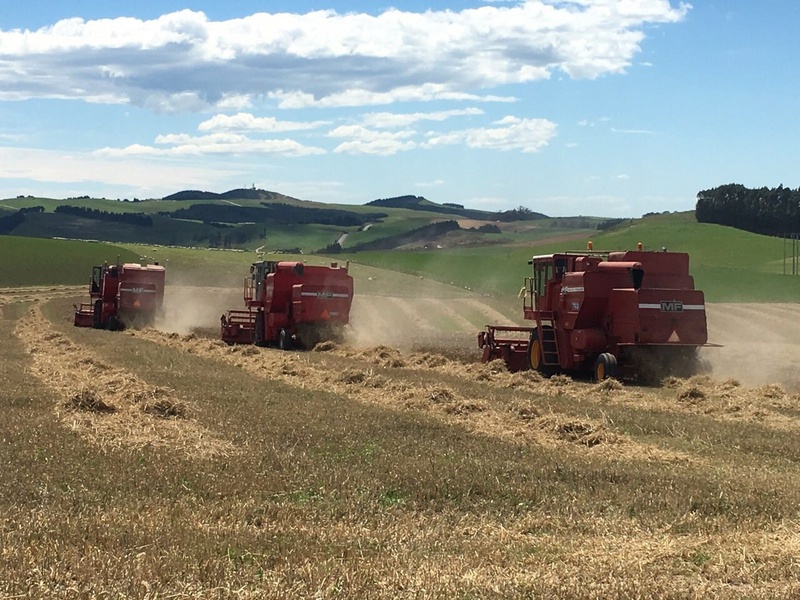 Crops cut this year were wheat barley and some clover, the wheat averaged about 7ton per hectare and barley 5/7 ton per hectare but clover was very poor, average moisture was 11/14 % despite a two year drought period, and wet start. All crops harvested were dry land cropping so these results were ok and about average for this area. 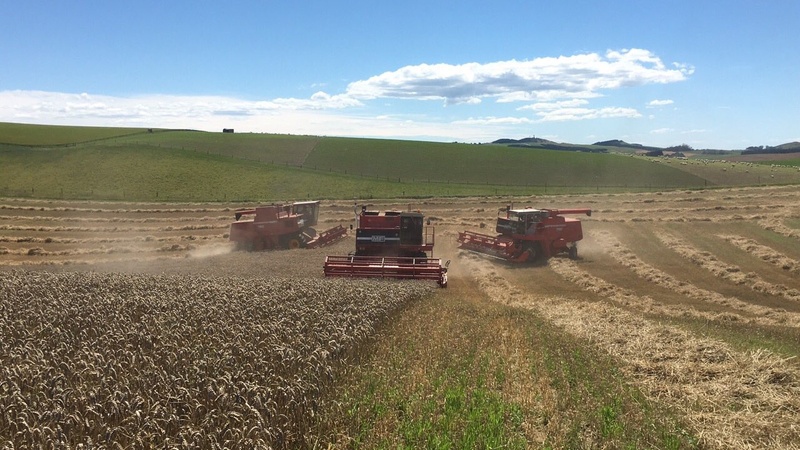 The following photos courtesy of Cameron McKay who at this time will be heading back for his harvest season here in the UK. Early season start, note the slightly black wheat ears following the wet start. The three Brantford veterans working their way across the New Zealand landscape. The boys pushing up the dust against the perfect sky back drop. Cameron gives the thumbs up after replacing the rear beater bearing! 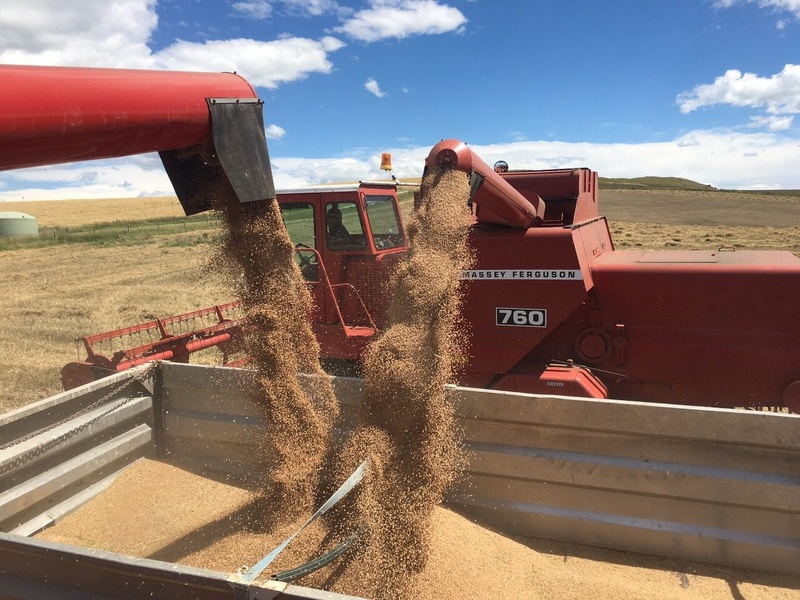 This was sent over from the state's before the harvest commenced, a good job done, and many more hours of service to come. A cracking shot this! 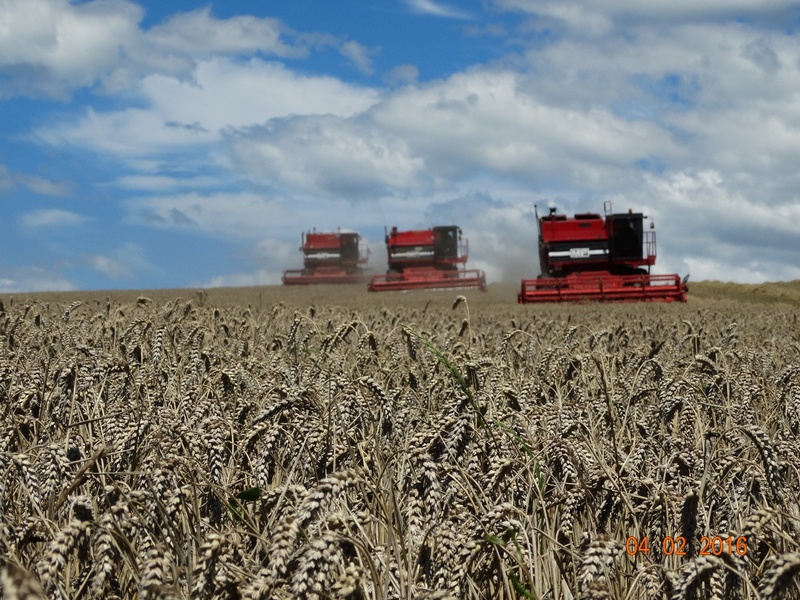 The big sky background, and combines on horizon, with the patiently awaiting crop that has completed its cycle. Taking out the final strip of this south island wheat field! 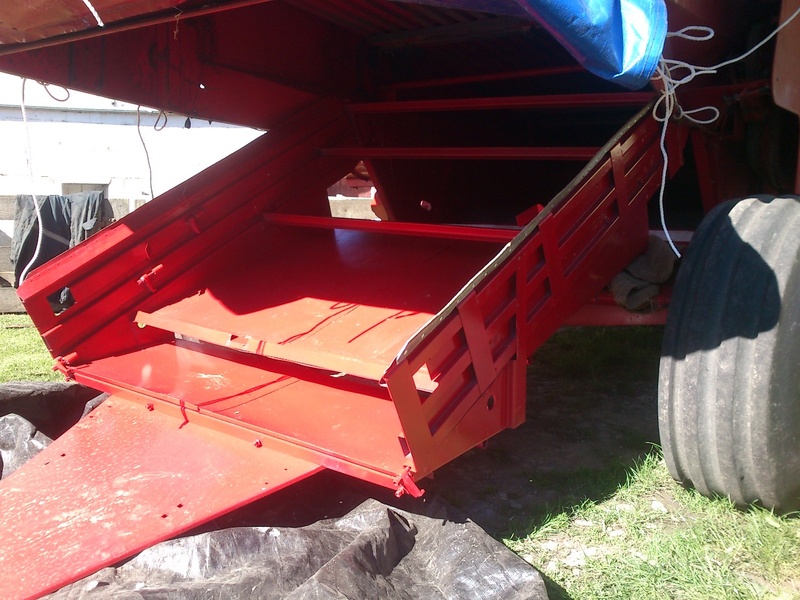 The chaser bin! 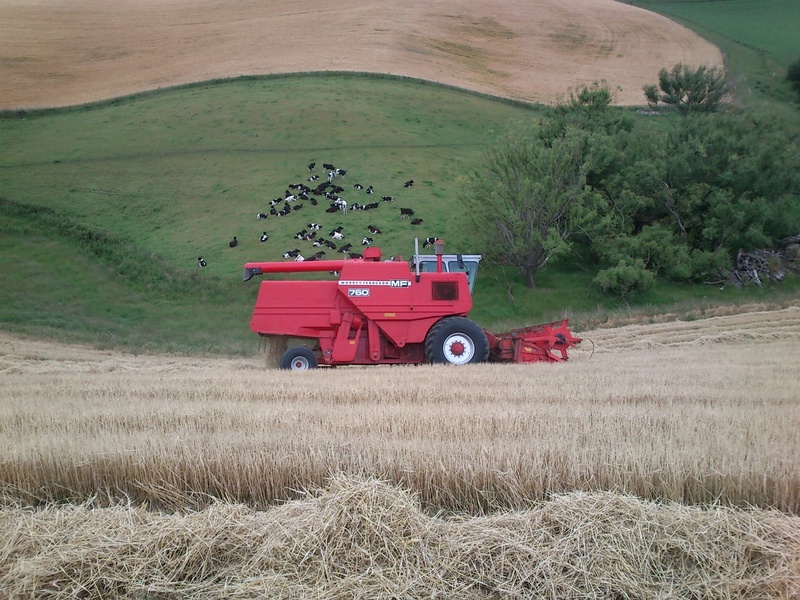 A volvo truck running the grain from the trio. The veterans unloading their precious cargo. 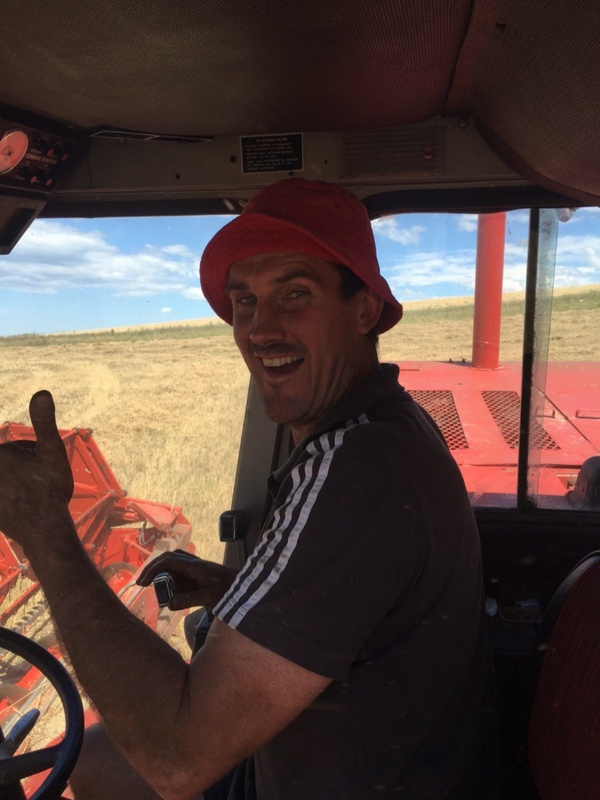 Cameron on board his trustee stead, thumbs up as the harvest progresses. 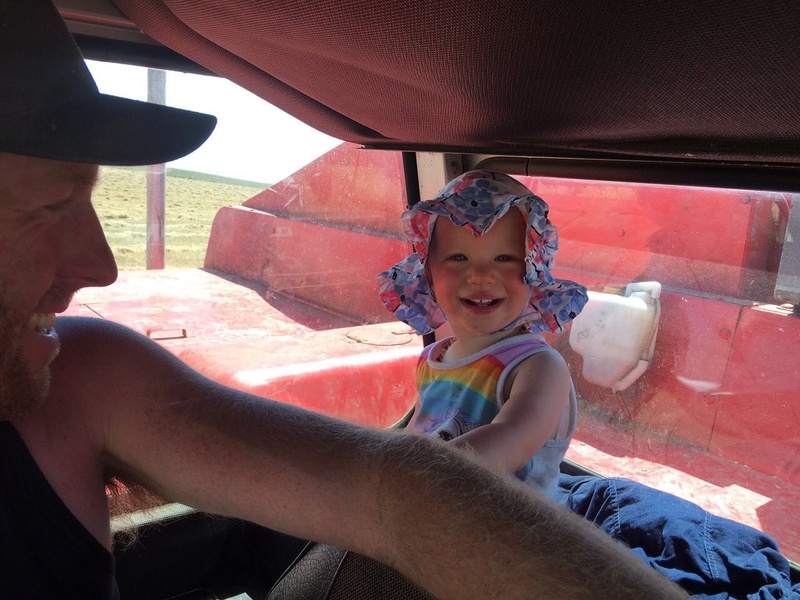 Cameron's business partner Andy Mc Ewan with the next generation 760 operator daughter Sophia. An early morning shot, the red giants patiently waiting their time to roll. Early start check around and fuelling up. 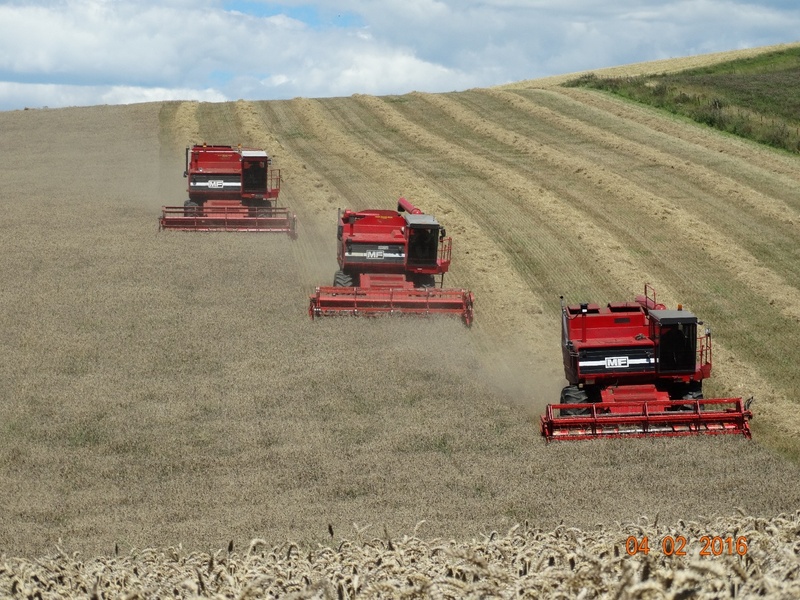 The rolling countryside of North Oamuru, and the 35 yr old veteran 760 bringing in the harvest. No flat prairie landscape in this part of the world! With its customary exhaust plume a beckoning finger' and the tranquillity of these rolling hills is shattered briefly for the harvest. 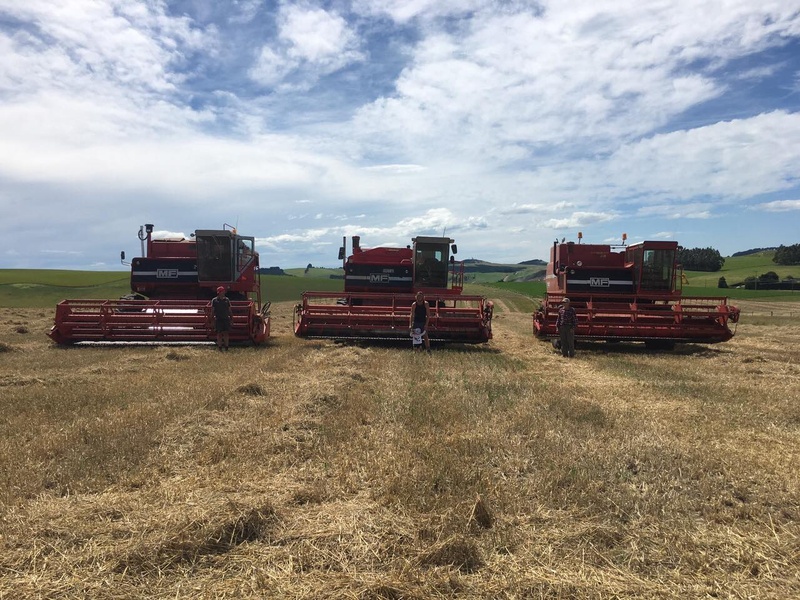 Our three veterans and their operators take time out for a photo the harvest is all but done again for another year, but thanks to Cameron And Andy these machines will continue to harvest and pay their way in an industry that today requires even more cost conscious controls! 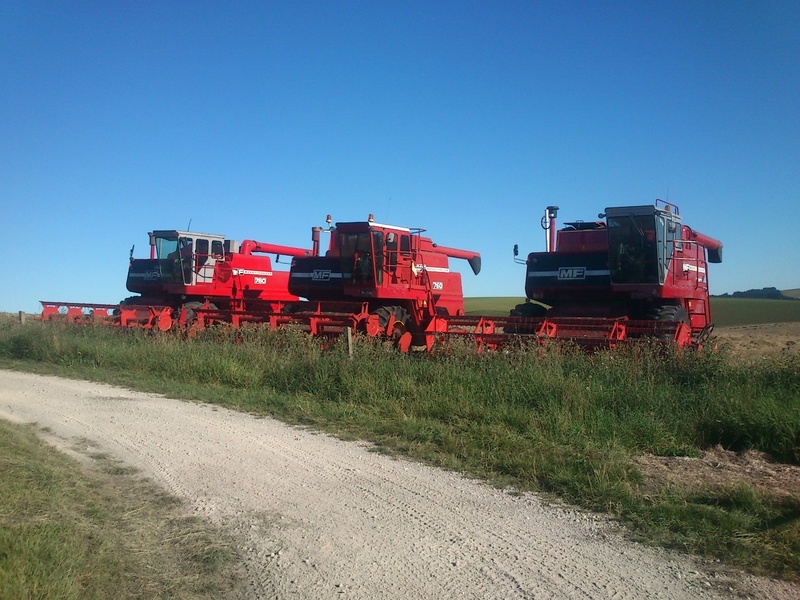 I guess these combines could see many more harvests. 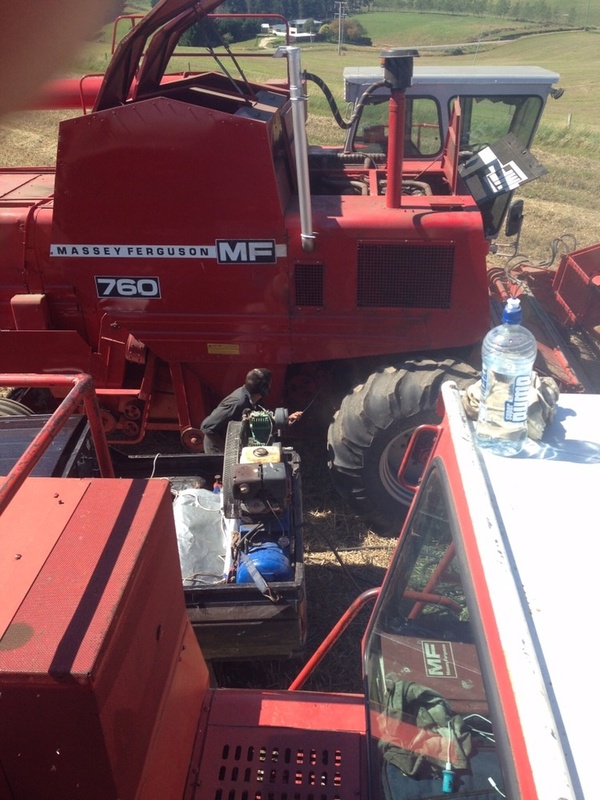 Coming up we visit another farming enterprise on South Island that uses vintage Massey Combines!